Epstein joined the San Francisco Bay Area's Livermore Action Group to protest the arms race and found herself in jail along with a thousand other activists for blocking the road in front of the Lawrence Livermore Laboratory. 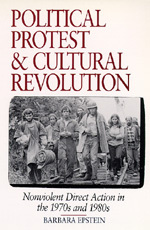 She argues that to gain a real understanding of the direct action movement it is necessary to view it from the inside. For with its aim to base society as a whole on principles of egalitarianism and nonviolence, the movement sought to turn political protest into cultural revolution. Barbara Epstein is Professor, History of Consciousness, University of California, Santa Cruz, and the author of The Politics of Domesticity: Women, Evangelism and Temperance in Nineteenth-CenturyAmerica (1981).